Yogi and mystic, Sadhguru answers a question on the different types of yoga and explains that any yoga that you do comes under four essential paths. 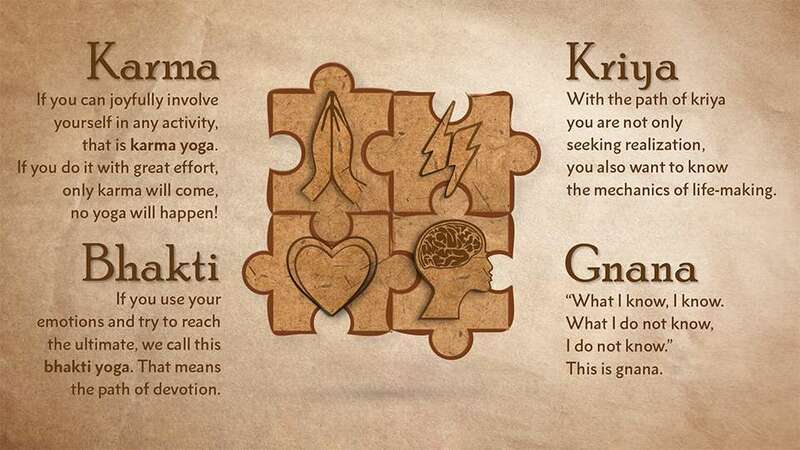 Questioner: Sadhguru, there are so many different types of yoga. How do I know which kind of yoga is best for me? Sadhguru: Right now, the only things which are in your experience are your body, your mind, and your emotions. You know them to some extent, and you can infer that if these three things have to happen the way they are happening, there must be an energy that makes them happen. Without energy, all this cannot be happening. Some of you might have experienced it. Others can easily infer that for these three things to function, there must be an energy behind them. For example, a microphone amplifies a person’s voice. Even if you don’t know anything about the microphone, you can infer that there is a source that powers it. These are the only four realities in your life: body, mind, emotion, and energy. Whatever you wish to do with yourself, it must be on these four levels. Whatever you wish to do, you can only do it with your body, your mind, your emotions or your energy. If you use your emotions and try to reach the ultimate, we call this bhakti yoga. That means the path of devotion. If you use your intelligence and try to reach the ultimate, we call this gnana yoga. That means the path of intelligence. If you use your body, or physical action to reach the ultimate, we call this karma yoga. That means the path of action. If you transform your energies and try to reach the ultimate, we call this kriya yoga. That means internal action. These are the only four realities in your life: body, mind, emotion, and energy. Whatever you wish to do with yourself, it must be on these four levels. These are the only four ways you can get somewhere: either through karma, gnana, bhakti or kriya – body, mind, emotion, or energy. “No, no, I am on the path of faith. I don’t need to do anything else.” Is there anyone who is only head, no heart, hands and energy? Is there anyone who is only heart, not the other things? You are a combination of these four things. It is just that in one person the heart may be dominant, in another person the head may be dominant, in yet another person the hands may be dominant, but everybody is a combination of these four. So you need a combination of these four. It is just that, only if it is mixed in the right way for you, it works best for you. What we give for one person, if it is given to you, it may not work well for you because that person is so much heart and this much head. That is why on the spiritual path there is so much stress on a live Guru. He mixes the cocktail right for you, otherwise there is no punch. It happened once. Four men were walking in the forest. The first was a gnana yogi, the second was a bhakti yogi, the third was a karma yogi, and the fourth was a kriya yogi. Usually, these four people can never be together. The gnana yogi has total disdain for all other types of yoga. His is the yoga of intelligence, and normally, an intellectual has complete disdain for everyone else, particularly these bhakti types, who look upward and chant God’s name all the time. They look like a bunch of idiots to him. But a bhakti yogi, a devotee, thinks all this gnana, karma and kriya yoga is a waste of time. He pities the others who don’t see that when God is here, all you need to do is hold His hand and walk. All this mind-splitting philosophy, this bone-bending yoga, is not needed; God is here, because God is everywhere. Then there is the karma yogi, the man of action. He thinks all the other types of yogis, with their fancy philosophies, are just lazy. But a kriya yogi is the most disdainful of all. He laughs at everyone. Don’t they know that all of existence is energy? If you don’t transform your energy, whether you long for God or you long for anything else, nothing is going to happen. There will be no transformation. These four people customarily can’t get along. But today they happened to be walking together in the forest and a storm broke out. It grew very intense and began raining heavily. They started running, looking for shelter. The bhakti yogi, the devotion man, said, “In this direction there is an ancient temple. Let’s go there.” He’s a devotee; he knows the geography of temples very well! They all ran in that direction. They came to an ancient temple. All the walls had crumbled long ago; just the roof and four columns remained. They rushed into the temple; not out of love for God, but just to escape the rain. There was a deity in the center. They ran towards it. The rain was lashing down from every direction. There was no other place to go, so they moved closer and closer. Finally, there was no alternative. They just hugged the deity and sat down. The moment these four people hugged the idol, there was a huge fifth presence. Suddenly, God appeared. If these dimensions don’t walk together, human beings will be one big mess. Right now, for most people, these dimensions are aligned in different directions. Your mind is thinking and feeling one way, your physical body is going another way, your energy another way. Yoga is simply the science of aligning these three dimensions. When we say “yoga”, for many of you it probably means some impossible physical postures. That is not what we are referring to here. Yoga simply means to be in perfect tune. When you are in yoga, your body, mind and energy and existence are in absolute harmony. When your body and mind are in a relaxed state and at a certain level of blissfulness, you can be free of so many nagging ailments. Let us say, you go and sit in your office with a nagging headache. Your headache is not a major disease, but just that throbbing could take away some of your enthusiasm for work and perhaps some of your capability for that day. But with the practice of yoga, your body and mind can be kept at the highest possible peak. The word “yoga” literally means “union.” When you experience everything as one in your consciousness, then you are in yoga. To attain to that unity within you, there are many ways. For example, there is hatha yoga. Hatha yoga means you start with the body. The body itself has its own attitudes, its own ego, its own nature. Apart from your mind, do you see, your body has its own ego? Suppose you say, “From tomorrow, I want to get up at five in the morning and walk on the beach.” You set the alarm. The alarm rings. You want to get up but your body says, “Shut up and sleep.” It has its own way. So we start with the body. Hatha yoga is a way of working with the body, disciplining the body, purifying the body, and preparing the body for higher levels of energy. All of us are alive, all of us are human beings. But all of us do not experience life to the same intensity because our pranic energies are not the same. Different people experience life in different levels of intensity. For example, someone sees a tree. A tree is just a tree. Most people don’t even see it. Somebody sees the tree in more detail. An artist sees every shade of it. Someone else not only sees the tree but also sees the divine in it. Seeing is not the same because the level of intensity with which you experience life is not the same. The whole process of yoga is to take you from something that you know, and take the next step into the unknown. We have made this yogic science almost like a physical science. Suppose you mix two parts of hydrogen and one part of oxygen, you get water. Even when a great scientist puts it together, it is water. Even if an idiot puts it together, it is only water. Similarly, in yoga too, whether a great yogi does it or an ignorant person does it, it does not matter. If he does the practices and sadhana properly, the result is there to be seen. In yoga, these systems have been identified. To start with, you work with the body, then you move to the breath, then to the mind, then to the inner self. Like this many steps have been created. They are only different aspects. They are not really different types of yoga. In fact, we address all of them at once. It is important that in a very balanced way all of them are addressed at once, as one unit. Otherwise, if you work just with the body, it is only preparatory in nature. So, there is really no division as such. Yoga is a union of all these. Editor’s Note: “Mystic’s Musings” includes more of Sadhguru’s insights on the types of yoga and their many subtleties. Read the free sample [pdf] or purchase the ebook.